McKinley was born in Niles, Ohio. When he was ten his family moved to Poland, Ohio ten miles away. McKinley attended public schools in Poland and in 1852 he enrolled in Ohio's Poland Seminary. At the age of 17, McKinley enrolled in Allegheny College in Meadville, Pennsylvania. He dropped out due to illness. In June of 1861, McKinley enlisted as a private in the Union Army. He rose to the rank of Brevet Major. One of his commanders was Rutherford Hayes, who rated McKinley's actions as a soldier highly. After his return from the army, McKinley studied law and was admitted to the bar in 1867. From 1877 to 1883, and then again from 1885 to 1891, McKinley served as a Republican in the House of Representatives. He was known as the foremost proponent of protectionist legislation. He favored a high tariff to keep out imports. 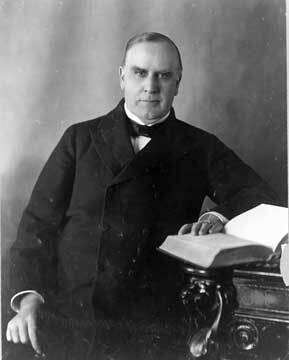 From 1892-1896, McKinley served as Governor of Ohio. Upon assuming the Presidency, McKinley called a special session of Congress to pass the Dingley Tariff Act, which raised tariffs to a new high. McKinley's Administration, however, will be best remembered for spanning the time that America moved onto the world stage as a major player. This took place primarily as a result of the Spanish American War. The war was almost forced on the President by the press, but resulted in the United States gaining possession of Puerto Rico, the Philippines and Guam. Spain capitulated and gave independence to Cuba - the stated goal of the war. In 1898, the same year as the Spanish-American War, McKinley approved the annexation of Hawaii. With the end of the War and the United States clearly in a position of world power after roundly defeating the Spanish, McKinley pursued a strong open door policy in China. This resulted in the participation of American forces in suppressing the Boxer Rebellion. Throughout his Presidency, McKinley remained dedicated to his wife Ida, who suffered from epilepsy, hardly leaving her side. On September 6, 1901, at 4:07 p.m. while he was attending the Pan American Exposition in Buffalo, N.Y., McKinley was struck by an assassin's bullet. He died seven days later. McKinley was the first President to use the telephone for campaign purposes.